Dog Might Games dice chests. CNC machinery (Computer Numerical Control) begins the process of turning wood stock into playing pieces. 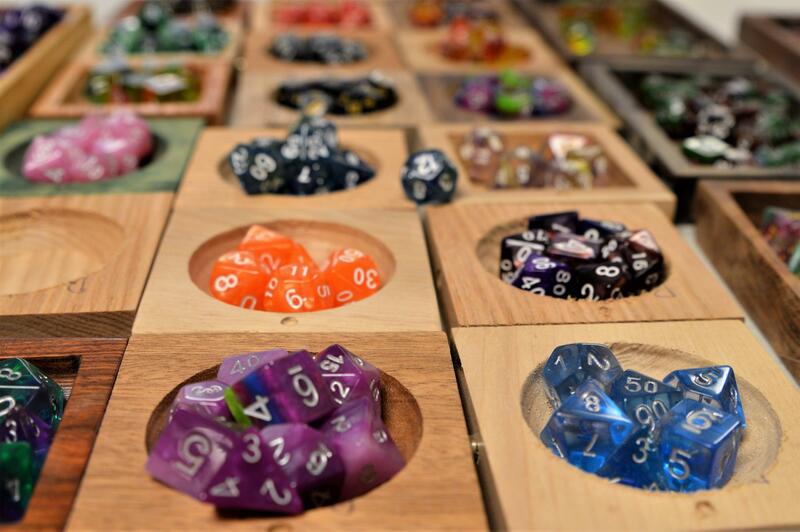 Wooden dice are among the many gaming accessories produced by Dog Might Games. Assembling chests for game accessories. A 3-D sculpted wooden screen for a table top game. A chest for dice and game pieces. Six-sided dice blanks waiting to be finished. Listen to the Dog Might Games co-founders talk about making gaming accessories. Michael Konas and Mike Cameron, co-founders of Dog Might Games. Mike Cameron and Michael Konas are the co-founders and creative forces behind Dog Might Games. If you visit their woodshop, you’ll first be greeted by a dog. He’s a rescue. When talking to Cameron and Konas, there’s a quick banter between the two. Sometimes you have to be quick to catch it. Mike Cameron introduces himself as the CEO. Michael Konas says he’s the CBO followed immediately by Cameron asking, “What does that even stand for?” and Konas replying, “I don’t know.” Usually CBO stands for Chief Brand Officer, but in this case, who knows. The two have known each other for nearly 12 years. “We game together. So, when I met Mike with some mutual friends and we started playing, you know, kind of nerdy games,” Cameron said. They say their “half-baked idea” turned into their first published game. Some of the dice produced at Dog Might Games. They created a second game called Livestock Uprising. As an afterthought, they made small wooden accessories for the game as a bonus for the crowdfunded project. They say the wooden stuff was far more popular than the game. They pivoted to game pieces, working out of a small space in Cameron’s garage. 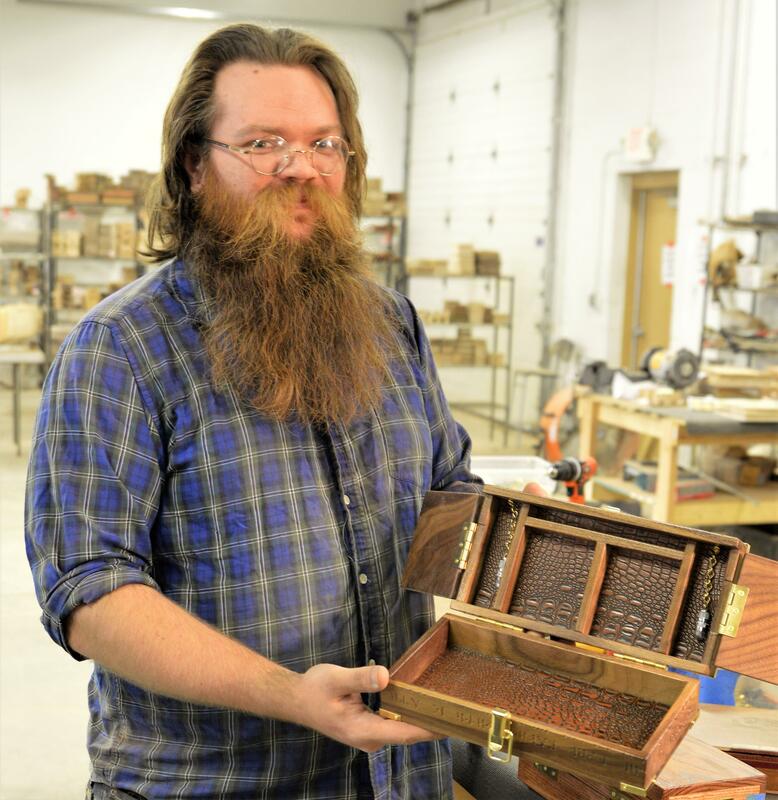 Cameron was a programmer by trade and a woodworker by hobby. Konas was an art professor at Eastern Michigan University. This world of dice with more than six sides and dice chests, dice towers, dragon sheaths, storage chests made of hardwood, some of them with inlays, 3-D sculpting, and engravings is all a bit more than I was aware existed. My game boards are cardboard. “We’re not your grandfather’s woodworkers,” Cameron noted. “We get ideas from our customers and from the people who work here. We’ll take anything and meld it together and come up with something really unique." 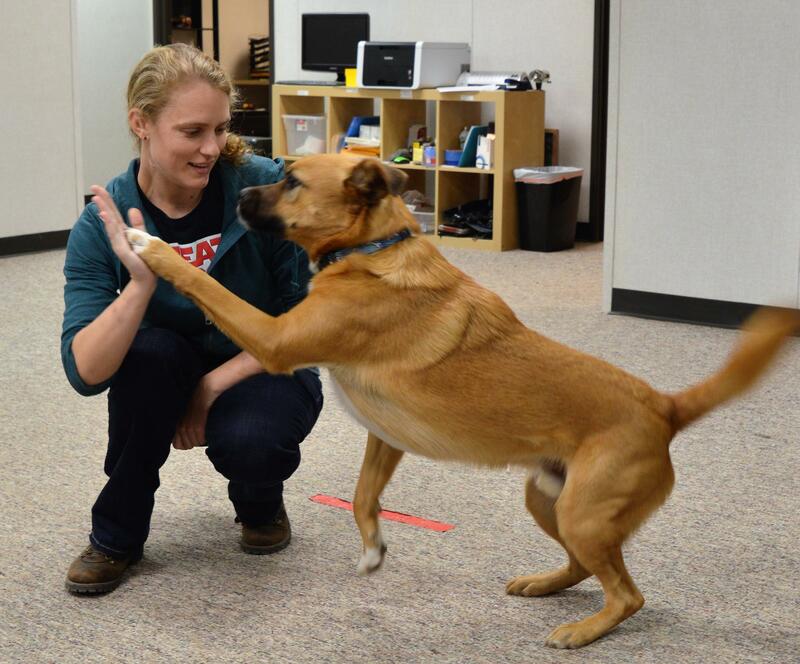 Sawdust gives Creative Director and board game designer Lindsey Rode a "high five." Not only is Dog Might Games often crowdfunded, it’s crowd-directed to a certain degree. “We have a lot of fans out there and we adore them. We have our own forums now and they throw us ideas. So, anything new is the best seller at any moment. We had the component collector which was an amazing hit. We crowdfunded that as well. I think we sold about 5000 units in about 28 days,” Konas said. 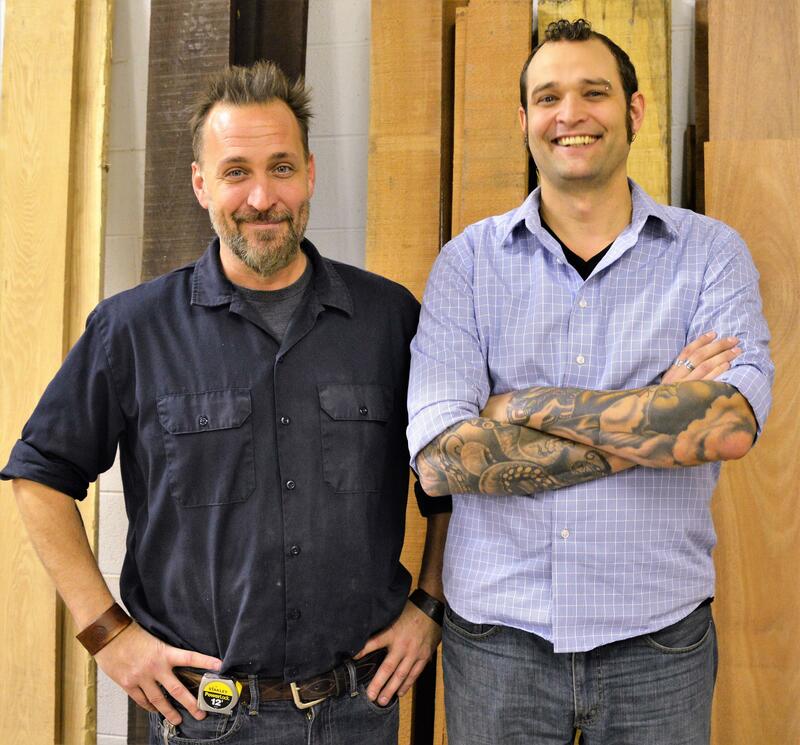 As the business has grown, Mike and Michael spend less time “hands on” making the pieces they sell. But, that frees them up to be more creative, think about new offerings, and to teach others how to do the woodwork. One of the chests made by Dog Might Games. “Mentorship is part of our DNA here. We want everyone in the shop to be able to do every job in the shop. So, we cross-train everybody in every position in every skill set as part of their moving from apprentice to woodworker and it’s vital here. We need it,” Cameron said as Konas nodded in agreement. One of those learning the woodworking trade is Annie Baker. She was an art major in college. She thought it wouldn’t hurt to hone skills and she needed a job. “It turns out the community was really great and I really enjoy doing it. So, I love working with my hands. Awesome,” she said. She’s a print maker, so about the only experience she had working with wood is carving relief cuts for printing blocks. Support for arts and culture coverage comes in part from the Michigan Council for the Arts and Cultural Affairs.